Holmes sits in his cell, thinking smugly that no one has been ale to produce evidence that he killed Benjamin Pitezal. It is cold and damp in his cell, but he behaves extremely well and is able to convince the guards to allow him to continue wearing his own clothing and pay for food and newspapers to be delivered to him. He reads about his growing infamy and about Geyer’s search for Pitezal’s children. Holmes is amused by the search, since he knows that Geyer will not find what he’s looking for. Even in prison, Holmes goes to great pains to maintain an appearance of politeness and respectability. This is what makes him so dangerous — maintaining this image comes so easily to Holmes that he can fool people long after they should have seen through his deceptions. Holmes finds pleasure not only in committing crimes, but in getting away with them. In prison, Holmes begins to write a memoir. He composes this work in a pastoral style, emphasizing the beauty of the town where he grew up, and the ordinariness of his childhood. His memoirs are mostly lies — as children psychopaths lie easily and hurt children and animals. He writes a prison diary, in which he wonders if his mother will write to him for his birthday, and says that a recent visit from Georgiana Yoke was a joyous occasion for him. This diary is full of lies; that Holmes wants is to maintain the appearance of innocence. Holmes’s memoirs are painfully easy to see through — they’re so pleasant and sentimental that they must be hiding evil and perversion. It’s unclear if Georgiana Yoke continue to love and believe him; what is clear is that Holmes is getting more and more desperate to prove his innocence. He’s trying the same tactics of deception, but these tactics are getting and less effective as Geyer’s investigation proceeds. Holmes writes a letter to Mrs. Carrie Pitezal, which he knows will be read by the police. He tells her that he took good care of her children, and that they’re currently with “Mrs. W” in London. He denies having killed the children. He reads the papers and learns that Geyer has found nothing in Philadelphia. This pleases him greatly. Larson presents Holmes’s denial of murder as a non sequitur, which strongly suggests that Holmes did, in fact, murder the children — it’s similar to the earlier scene in which Holmes told a woman, “Don’t be afraid of me,” which naturally made the woman feel afraid. Arn, Jackson. "The Devil in the White City Part 4, Chapter 2: Moyamensing Prison." LitCharts. LitCharts LLC, 1 Jul 2015. Web. 25 Apr 2019. Arn, Jackson. "The Devil in the White City Part 4, Chapter 2: Moyamensing Prison." LitCharts LLC, July 1, 2015. 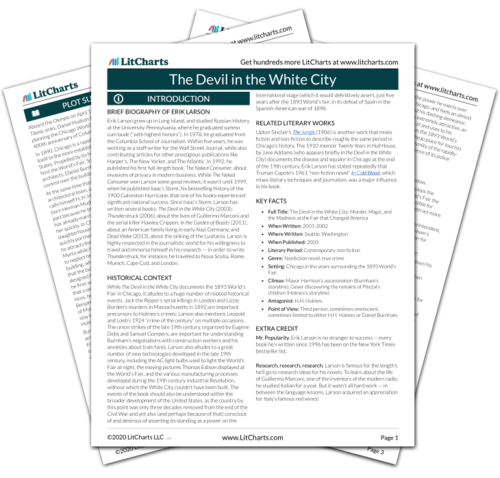 Retrieved April 25, 2019. https://www.litcharts.com/lit/the-devil-in-the-white-city/part-4-chapter-2-moyamensing-prison.